This post is primarily for those who seldom or never ride bikes. Bike rides are one of the best means of bringing one close to nature. Unlike cars which are designed to isolate one’s senses from nature and the out of doors, bicycles by virtue of their design expose you to nature and ones surroundings. For those like me who don’t ride for the physical challenge, it can be an exhilarating experience as long as there are no challenging hills. On level ground one can leisurely bike 20-30 miles with hardly breaking a sweat. Bike riding is far more enjoyable than walking because you can cover a lot more ground without tiring. 100% of your energy is used for mobility whereas in walking much of your energy is used to support your weight on your feet. Yet your senses are only inches higher off the ground than walking. If you want to stop and explorer it is a simple matter with a bike. You have a lot of reserve energy not expended on carrying your considerable weight. You can easily travel five times faster than walking and see, smell, hear, and feel your surroundings as intimately as walking without tiring. It is this intimacy that makes biking such a joy and pleasure. Even on cold days riding generates enough warmth to feel comfortable. When in the company of others it is as easy to chat as it is when walking. So not only do bikes bring one closer to nature they bring people closer to others riding along side or passing by. Try doing that in a car. They also allow one to say hi to walkers they pass. And after a pleasant bike ride people feel more invigorated, energized, and fulfilled. You cannot gain such fulfillment and engagement in a car. I have a mountain bike which I used to ride in ‘The Forest of Nisene Marks State Park‘ when I lived nearby a couple of years ago. Much of the trail is fairly level but there are some challenging hills as well. There is a Stevens Creek Trail running from Sunnyvale to Mountain View that I heard offers a very pleasant bicycle ride mostly away from traffic along Stevens Creek which I plan to use soon. The best places to ride are bicycle trails away from traffic where you do not have to worry about being hit by a car. There is a Stevens Creek Trail Joint Cities Feasibility Study being done between Mountain View, Los Altos, Sunnyvale, and Cupertino that will interconnect various segments of the Stevens Creek Trail along Stevens Creek so you can ride your bike from Cupertino all the way to the Shoreline in Mountain View. This would be a fantastic ride that I hope one day to be able to make. Unfortunately there are some Cupertino residents who object to the trail running in front of their houses since property lines are too close to the creek for a trail to be built. There is also an unofficial trail along the Southern Pacific railroad track between Stelling Rd. and Bubb Rd. that could be developed into a bike trail (see Union Pacific Railroad Trail for Bicycling and Walking) as well as other areas in Cupertino that could be developed for safe bicycle and pedestrian use for all ages away from cars traffic with a little imagination if only the citizens of Cupertino would give their City Council, Bicycle Pedestrian Commission, and Park and Recreation Commission some suggestions, encouragement, and support. 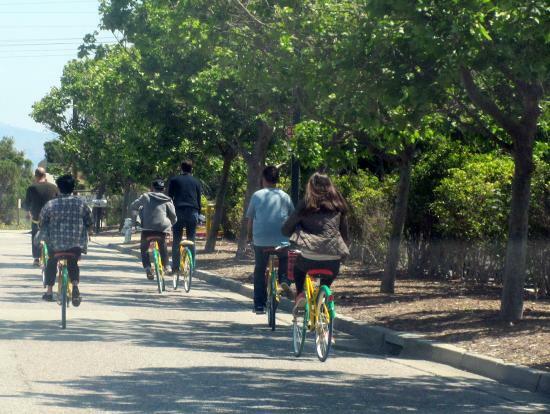 Other cities such as Mountain View and Sunnyvale are making more nice bicycles and pedestrians trails away from traffic. So can we. This entry was posted in Article, Considerations, Ideas and tagged and fulfilled, bicycle trails away from traffic, bike faster and longer than walking, bike riding, bringing one close to nature, energized, exhilarating experience, intimacy, invigorated, Stevens Creek Trail, Stevens Creek Trail Joint Cities Feasibility Study. Bookmark the permalink. Cool, you should repost this on nextdoor. Feel free to link it on your Facebook and blog.